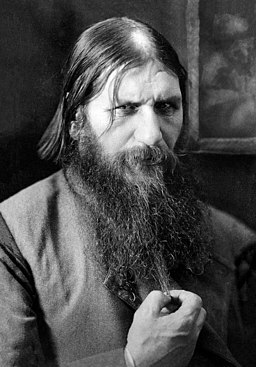 Below is a dual image of the natal horoscopes of Russian dictator Vladimir Putin (October 7, 1952) and ‘holy man’ and con artist Grigori Rasputin (January 22, 1869). As you see the charts are messily penned upon with astro-notes and both men were born during transit Uranus in Moon-ruled Cancer (see chart for the 3 dates of Rasputin’s Uranus Return/s around the time of Putin’s birth–Uranus in Cancer tells of those who fraternize with strange or unusual people). And both were/are visionary maverick who were born under Solar Eclipses in late Leo (astrological degrees!) with different Saros Series–15 North 1868/69 and 8 South 1952, yet conjoined by degree in the 25 to 28-degree range of royal, Sun-ruled Leo. Rasputin’s 15 North theme: joy through commitment. Putin’s 8 South: separation, loss; possible physical injury (Brady). 8 South last perfected in 2006 @29Virgo; 15 North last manifested @22Scorpio as the Prenatal Solar Eclipse (‘PE’) of Winter Solstice 2012! And curiously, Rasputin’s and Putin’s Solar Eclipses conjoin the natal Mars and Ascendant–with royal Regulus rising–of Donald Trump (who fancies himself a ‘king’ but you may know him as a con artist and a liar) and all were activated or triggered by The Great American Eclipse of August 21, 2017 in the 1 North series, aka, The Mother of All Eclipses. The caution for Regulus: success if revenge is avoided, otherwise all that’s been gained will be taken away). 1 North themes: ‘unexpected events’ and ‘info is distorted and possibly false’ (Brady’s Predictive Astrology). Well, we’re certainly inundated by false information and so-called ‘fake news’ these days, aren’t we? And propaganda. Especially since deceptive, elusive, Neptune has been floating through its own sign of secretive Pisces and trailing paranoia, fear, flooding, leaks, contagion, fraud, scandal, and dissolving borders in its wake. Now my intention here is to make these two natal horoscopes available online for future reference, speculative though their data may be, and naturally there are other cosmic links and time links between the two men, plus Mr. Trump. But in an effort to blog briefly, I shall close and leave them to you to sort out if and as you wish!